Q. I just bought a Chevy Bolt. It has no CD player. I have a music history course on 48 CDs, and other courses on CDs. I am only going to listen to these once, so I don’t want to have to transfer the audio to a USB device. Is there a CD player that I can hook up to a Bolt’s audio system? A. Like laptop manufacturers, carmakers are slowly phasing out compact disc players as integrated features in favor of digital audio files stored on USB devices or streamed from an internet connection. If your car dealer has no aftermarket solutions to suggest, it is possible to cobble together an improvised approach for less than $50. Most dashboard entertainment systems still have an auxiliary audio port available; check your car’s manual for the location on the dashboard. In most cases, you can use this port and a 3.5-millimeter auxiliary audio cable to connect the headphone jack on an inexpensive battery-powered portable CD player. Then set the audio input on the dashboard to AUX and push the play button on the CD player. 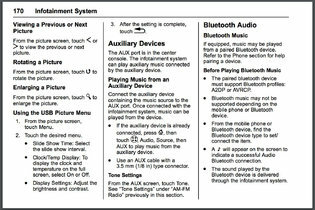 Check your car’s manual to find out about the types of audio devices you can connect to your dashboard entertainment system. If you do not have an old portable CD player on hand, you can still find petite single-disc units that are tiny enough to be stored in the car’s glove box, or small CD boomboxes at stores like Amazon, Best Buy and Target. Prices generally start around $20, but you may want to pay a little more for a shock-resistant player. An auxiliary audio cable can cost as little as $5 at those same types of stores, but prices vary based on length and style. If you do not want to rely on batteries to power the player, an electrical adapter for the car’s 12-volt power port is another option. Most new cars support Bluetooth wireless connections, so if you would prefer to skip the auxiliary cable, consider swapping in a Bluetooth adapter with its own 3.5-millimeter plug that connects to the CD player. Once you pair the adapter to the car’s Bluetooth system, you should be able to stream the audio from the CD player to the sound system. Taotronics and Mpow are among the companies that make Bluetooth adapters for less than $35. While some audio purists may fuss about sound quality from an external CD player, spoken-word tracks are more forgiving to the ears than complex music. As with built-in dashboard players, though, the discs may be prone to skipping on rough roads or in sudden stops. If you plan to listen to future educational courses in the car, you might want to see if the company has the material available as downloadable files or as a digital stream you can play through a smartphone or tablet; some companies may also offer a free digital version if you buy the course on a disc. The USB ports for vehicle entertainment systems typically do not support USB-based disc players for audio output, but are intended to connect mobile devices like smartphones and digital music players to the car’s speakers. Some systems can even play a USB flash drive filled with digital audio files. Tech companies are also getting their software in the dashboard to help integrate smartphones and cloud services through platforms like Google’s Android Auto, Apple’s CarPlay and Microsoft Connected Vehicle, while Amazon’s Alexa assistant will be showing up soon in some Ford and Volkswagen models.